Additional Information: One stateroom converted into a brig for prisoners. The Raider Class was a product of the Unification War effort, produced solely by the Independents on Persephone. Designed by the Independent’s best engineers to maximize effectiveness using minimal manufacturing resources, Raider Class ships were determined to be very effective in their intended role as fast, lightly armored warships with the ability to strike deep into Alliance territory and cripple shipping. Due to the shortage of missiles at the later stages of the war, the last two ships commissioned were modified and fitted with cannons only. The Independent government authorized 20 vessels in this class, but only 9 were laid down, and only 5 of these were ever commissioned into active service: Alabama, Florida, Shenandoah, Emden, and Atlantis. Of the five, the Alabama, Shenandoah and Emden were destroyed during the war, Florida and Atlantis were interred, and the rest were broken up on the stock by Alliance Naval forces at the conclusion of hostilities when the Iskellion (ITS) shipyard was recaptured. The Florida was later destroyed as a gunnery target, and the Atlantis was sold as salvage in a private auction in 2511. Laid down in 2509, she was the last of the Raider Class ships to be completed and commissioned by the Independent Navy in January, 2511. When hostilities ended, the Atlantis had just departed for her first combat voyage and was interred on Persephone, having never fired a shot in the Unification war. Before the ship could be relegated to the role of target ship for the Alliance Navy, as was the fate for her sister ship, Florida, the Atlantis was sold at auction to a senior naval captain who intended to use her as a private vessel upon his retirement. From 2511 until 2518, the ship was maintained in a private hanger on Persephone, after which point in time its whereabouts became unknown. Description of Ship: The Atlantis is an aerodynamically streamlined vessel capable of atmospheric flight as well as travel in space. The external hull is painted in a black and grey dazzle paint scheme using infrared-defeating paint. The dazzle paint serves to break up the ship's outline and makes her harder to target. The ship's wings contain the main landing gear and its machinery. The Atlantis may be accessed through the forward cargo ramp, which also contains a personnel hatch and ladder for use when the larger cargo hatch is not required. Machinery to raise/lower the Cargo Ramp is located to either side of the ramp in sealed areas. (NB: One long range missile with decoy warhead concealed near each landing gear, with remote launching from the bridge). The cargo ramp leads directly onto the cargo hold on the lower deck (C Deck), which is 20 feet in height and 40-50 feet wide, extending for 55 feet from the edge of the bow ramp to the shuttle bay bulkhead aft. The Cargo Bay will accommodate up to 100 tons of cargo. Two 20 x 10 sloping areas on either side of the ramp contain the forward landing gear. The Cargo Hold deck plates may be raised to allow access to ship's systems located between the outer hull and the deck. At the aft central end of the Cargo Bay is a large winch and steel cable spool which is used to pull heavy loads into the Cargo Bay. Directly port side of the winch is a fresher and the ship's small laundry facility. Internal access to the Cargo Bay is by port and starboard hatches set in B Deck with ladders attached to the walls and leading down to the cargo area, and by the hatch to the personnel/cargo lift on the starboard side. An automatic fire suppression system is located in the ceiling with spray valves placed to adequately cover both the Cargo Bay and Shuttle Bay, with separate fire triggers for each of the Bays. The Shuttle Bay is located aft of the 35 foot Grav Spinner in the last 40 feet of C Deck, and houses the Atlantis's shuttle and her large armored skiff. The Shuttle Bay is accessed externally through a 35 foot hatch/ramp aft, centered in the aft external bulkhead, which can be mechanically lowered and raised. When the Shuttle Bay is in use during space operations, the air is first extracted into a special holding tank located under the deck plates.to prevent atmospheric loss, and then replaced when the ramp is closed and personnel are using the facility. During the landing or take-off sequence, a series of strobe lights set in the interior surface of the ramp and on the shuttle bay deck plates flash in timed sequence, creating a pulsating landing guide to assist pilots in lining up for a proper landing. Internally the Shuttle Bay may be accessed by personnel through a port side companionway leading from C Deck up to bulkhead hatch on the Main Deck (B Deck), and a 5'x5' shaft on the starboard side fitted with a personnel/cargo lift between all decks, with a hatch on each deck allowing secured access. The aft 65 feet of external walls of C Deck contain the bottom section of the ship's fuel bunkers, five on each side, and each one holding 29 tons of liquid hydrogen fuel. And on the port side are water and waste storage tanks. 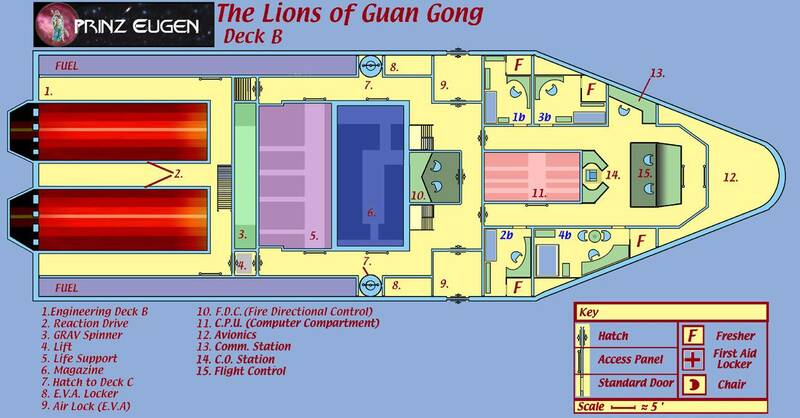 The next deck is the Main Deck, or B Deck, where the Bridge, Ship's Office, Computer, Officer's Quarters, Main Engineering (Reaction Engines, Grav Spinner and Life Support), armored Magazine, EVA Access, Avionics, Communications, Sensors and Fire Direction Control (FDC) stations are all located. External access to B Deck is provided through two forward airlocks, starboard and port. Internal access points to B Deck are: (1) a personnel companionway portside aft leading down to the Shuttle Bay; and (2) a personnel/cargo lift adjacent to the starboard side of the Grav Spinner. In the event of an emergency, the wall between Engineering and the starboard lift may be removed to allow access to Engineering. Aft of the companionway to the Shuttle Bay is Engineering. Engineering on B Deck contains the Reaction Engines, and the middle section of the Grav Spinner, and Life Support. Deck plates in Engineering between B Deck and A Deck are all gratings that can be removed for heavy maintenance. Personnel access to B Deck Engineering is by a central companionway from A Deck directly aft of the Grav Spinner, and in an emergency two ladders on the fuel bulkheads port and starboard that can be accessed from A Deck by raising the deck gratings. Forward of Main Engineering is the heart of the ship, Life Support, which is accessed by two secured maintenance access panels in adjacent passageways, one each to port and starboard. Forward of Life Support is the ships armored ammunition Magazine and the auto-feed mechanisms that keeps the ship's cannons continuously fed with high explosive rounds. The armored Magazine is accessed in the same manner as Life Support, through two secured access plates in the port and starboard passageways, which may be removed when loading rounds. On the deck forward of the Fuel Bunkers, both to starboard and port, are hatches leading down to the Cargo Deck. Adjacent to the hatches are EVA storage lockers, containing the Vacc Suits necessary for EVA activities/missions. Forward of the Magazine is the ship's armored Fire Direction Control (FDC) room, where the gunners control the 20 and 200 pound cannon mounts in defense of the ship. Access to the FDC is through a hatch in the forward bulkhead. To port and starboard of the FDC is the EVA Operations Area, where EVA parties are prepped and assembled for external operations. In addition, two companionways located to port and starboard of the FDC allow direct access to A Deck above. Each EVA Airlock is externally equipped with a winch and cable system with a magnetic hook to allow EVA personnel to secure and retrieve external cargos or personnel. Forward of the EVA Operations Area is a bulkhead running the width of the ship. This bulkhead separates Officer Quarters, the Computer and the Bridge from the rest of the ship. Two companionways lead forward through this bulkhead, the entrance to which has hatches to seal off the bridge from the EVA Operations Area. To starboard ( PORT ) are the doctor's and pilot's quarters, and to starboard are the engineer's and captain's quarters. The area between these two companionways holds the ship's computer, which is accessed through a sealed access plate by the captain's quarters. Forward of the ship's computer is the Bridge and Commo/Sensor/ECM station. The Commanding Officer's station is adjacent to and faces the ship's flight deck, serving as a point which controls all ship systems remotely. The Pilot and Commanding Officer sit in a raised area looking out the cockpit view port. In the bow is the ship's advanced Avionics, communication and sensor equipment. NOTE: All access to the ship via external hatches and ramps, and all internal and external hatches, may be controlled and locked/unlocked from the bridge. An automatic fire suppression system is located in the ceiling with spray valves placed to adequately cover Engineering, Life Support, EVA Operations, FDC and Officer Country/Bridge, with separate fire triggers for each of these sections. The ship's magazine may be flooded by bridge controls with direct pressurized water flow from the ship's main water supply on C Deck. The third deck is the Crew Deck, or A Deck, which contains Living Quarters for the crew and marines, a Mess Hall/Day Room, Galley, Infirmary, Brig, Engineering (Pulse Drive, Power Plant and Grav Spinner), Turret and the ship's Armory. The single 200 pound cannon turret is located externally above the Mess Hall/Day Room. Each of the quarters on this deck contains its own fresher and toilet facility. Main Engineering is located in the stern aft of the Grav Spinner, and contains the ship's Pulse Drive, Power Plant and Engineering station. Access down to B Deck Engineering is provided by a central companionway, with emergency access through two ladders when deck plates are pulled up to port and starboard. A Deck access to Engineering is provided by a passageway to port of the Galley, secured by a hatch at the port end of the Grav Spinner. The ship's living areas are forward of the Grav Spinner. The Infirmary is located centrally to starboard and the Galley to port immediately forward of the Grav Spinner. Forward of the Galley and Infirmary is the Mess Hall/Day Room, which serves the crew as a general assembly area for meals and relaxation activities. Along bot walls of the ship's mess are the crew's folding jump seat. 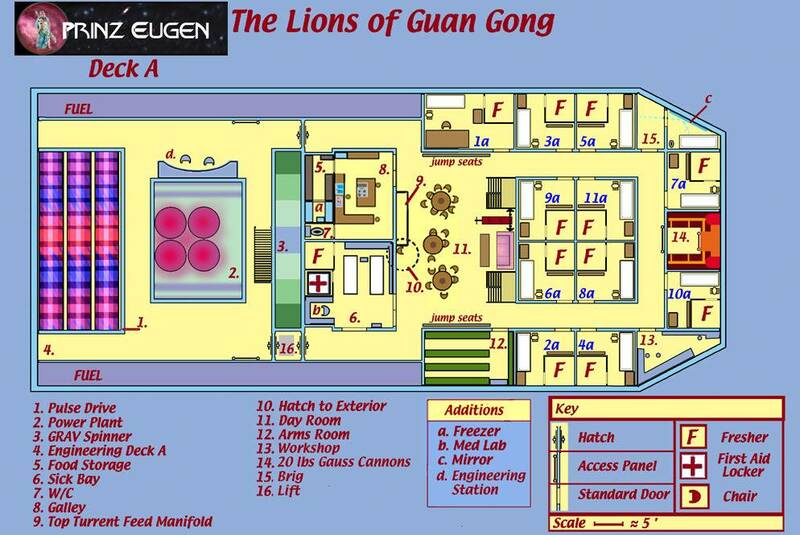 Access to A Deck is provided by two open companionways on the forward edge of the Mess Hall/Day Room, which lead down to B Deck and the EVA Operations Area. 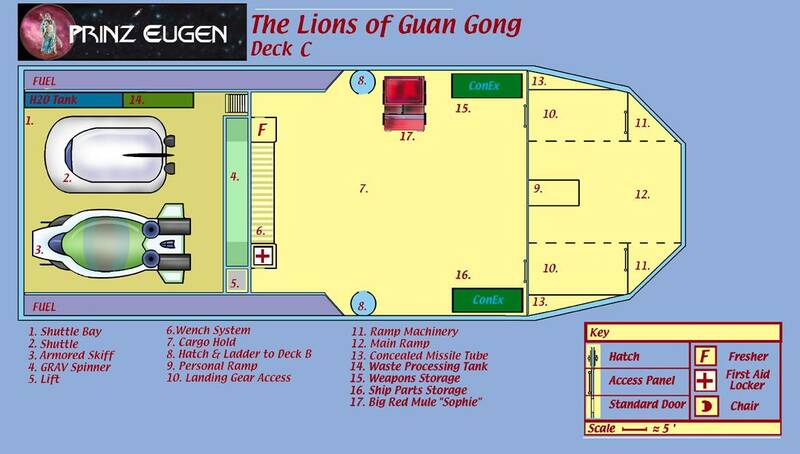 Between the two companionways down to B Deck is the large wall mural of the patron entity of the ship and her mission: Guan Gong. On the wall behind it is the creed of our crew, so that we never forget our purpose in the Rim. In addition, the Ship's Lift terminates on A Deck and is accessed through passageway ending in a hatch on the starboard side of the Grav Spinner. All three decks are served by this personnel/cargo lift. The ship's Armory is located on the starboard side of the Mess Hall/Day Room area, and contains the small arms and explosives for use by the crew. Located on the port side of the Mess Hall/Day Room is the Mercenary CO's quarters. The ship's Brig is located in the forward port corner of this deck, which allows incarcerated personnel to be held safely and securely. A heavy drop bar on the outside of the corridor door prevents escape attempts. Forward and center of this deck, occupying the space of one crew stateroom is the hard point and ammo terminus for a dual 20 pound gauss cannon (2x1) battery. The remaining space on A Deck is devoted to 11 individual/double occupancy staterooms, each with its own fresher system. An external hatch in the ceiling of A Deck, aft of the 200 pound cannon turret, allows external access to the upper exterior surface of the ship's hull. This allows personnel to service the cannon turret and perform maintenance as needed outside as needed. The hatch opens inwardly, so that during operations in space the hatch is unable to be opened. An automatic fire suppression system is located in the ceiling with spray valves placed to adequately cover Engineering, Infirmary, Galley, Mess Hall/Day Room, and Crew's Quarters.with separate fire triggers for each of these sections. Can we add the cabin allocations on here as well please? Silent Hunter wrote: Can we add the cabin allocations on here as well please?